Consultations on a government program outlining reforms planned to bring Turkey closer to meeting the European Union's standards for membership are in the last stage, Foreign Minister Ali Babacan said yesterday in Ankara. Copies of the Third National Program, which is several hundred pages and is still in draft form, were sent last month to both political parties and nongovernmental organizations for their comments and contributions. 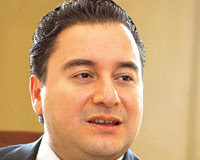 Fifty-one of the 87 NGOs presented with the plan sent their comments in written form to the government, Babacan said. The draft will be finalized by the government after it receives all comments and contributions from political parties and NGOs. For their part, CHP and MHP are still stubbornly refusing to sit down and review the third NPAA.